Tap Water is Killing You! You've heard the statistic... 'You're composed of 70% water' which is about the same percentage as water on earth? But did you know, that of the 75% of water on earth, only 1% is accessible for drinking? Thinking even deeper - of that 1%, how much water are you drinking that has been purified by the earth without contaminants from chemicals found in commercial (non-organic) agriculture? "The US Environmental Protection Agency (EPA) has identified over 700 pollutants found in our drinking water (Chek, 2009)." These pollutants are wreaking havoc on your immune system. For instance, commercial chemicals such as pesticides, herbicides, and fungicides are meant to disrupt the reproductive systems of the insects, which in turn disrupts our hormonal systems as well. Likewise, Chek (2009) noted that our tap water has almost as much chlorine as a swimming pool, meaning this chlorinated water is killing all the healthy bacteria in your gut leaving you with a compromised immune system. Okay, tap water is bad, SO WHAT DO I DO NOW?! 1) Go to the website findaspring.com to find a spring in your area to either fill up water yourself weekly, OR have the company deliver straight to your doorstep. 2) Have individual filters placed on your shower heads as well as sink faucet for cooking and bathing. OR, I have a whole-house filtration system in my home to minimize exposure to the chlorine, chemicals, and heavy metals. Remember, if it's in on your skin, then 60% of what's in that water is being absorbed into the body (Chek, 2009). 3) Drink and store water in glass containers, as plastic leaches xenoestrogens into your water. Xenoestrogens mimic estrogen in the body and has a major role in fetal, child, and adolescent development, so you can imagine the negative effects xenoestrogens have on fertility, weight gain, immunity, and mental health. If estrogen is needed for essentially every organ and tissue in the male and female body, then it is critical to remain aware of the potential harm an imbalance could cause to our estrogen receptors. For instance, many of my patients have become aware of these dangers once they've experienced hormonal imbalances due to synthetic xenoestrogen’s such as birth control. Please note that just because the container says “BPA Free” does not mean that is is not leaching xenoestrogens or a chemical called phthalates into your water. These chemicals are used in softer plastics and break down very easily in the heat (eg, sunlight, sauna). My mentor Paul Chek says to especially never drink water from smokey plastic containers because they leach the most chemicals (Chek, 2007). 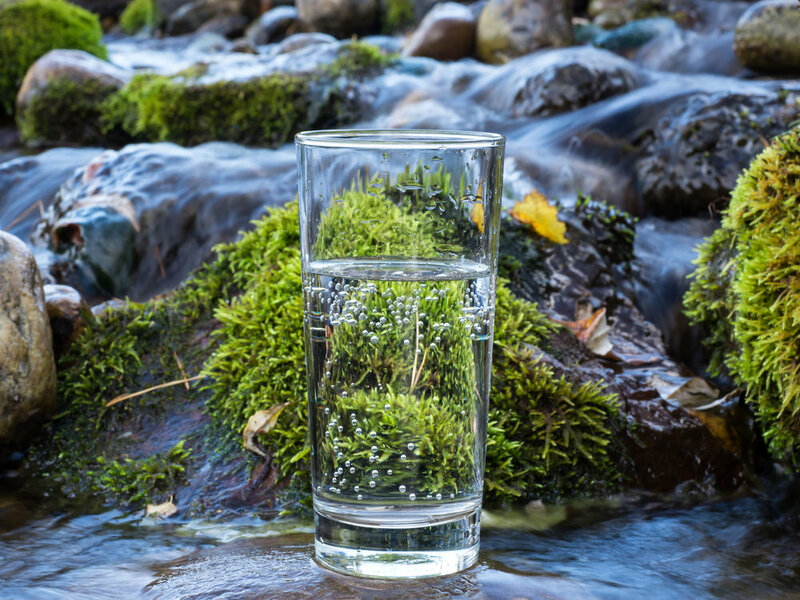 4) If you do choose to use a home filtration system for drinking ALWAYS remember to add some minerals back to your water. This will provide sufficient nutrition for the body and help detox your cells of pollutants. Otherwise, water that does not have sufficient minerals (soft-water) will draw the minerals from your own body. I recommend a pinch of pink Himalayan sea salt to ensure your water has optimal health giving properties. Also, please make sure your home filtration system takes out the fluoride in your drinking water as most systems on the market do not provide this extra step. 5) Drink half your body weight in ounces each day. As an example, a 200 pound person would need to drink 100 ounces of high quality water a day (Chek, 2009). Therefore, that would be slightly over 3 liters (33.8 per liter) a day depending on if they were an athlete or training in hotter temperatures. If you're having trouble drinking enough water, then I recommend putting a drop or two of essential oil into your bottle to give it a more inviting taste; I fluctuate between grapefruit, lime, peppermint, and lemon oils. Don't use your body as a filtration system and allow a serious illness to be the cause for change. Just because you can't see something does not mean it is not causing your body harm. As I tell all my patients, "Don't Be Reactive, Be Proactive!" Drink half your bodyweight in ounces of clean mineral dense water a day and you will find you are taking one of nature's greatest medicines. When traveling I always use http://www.findaspring.com/ to find clean water in the area. Here is a video of me filling up on fresh spring water in Carlsbad, CA. Chek, P. (2009). How to eat, move and be healthy! : your personalized 4-step guide to looking and feeling great from the inside out. San Diego, CA: C.H.E.K. Institute.